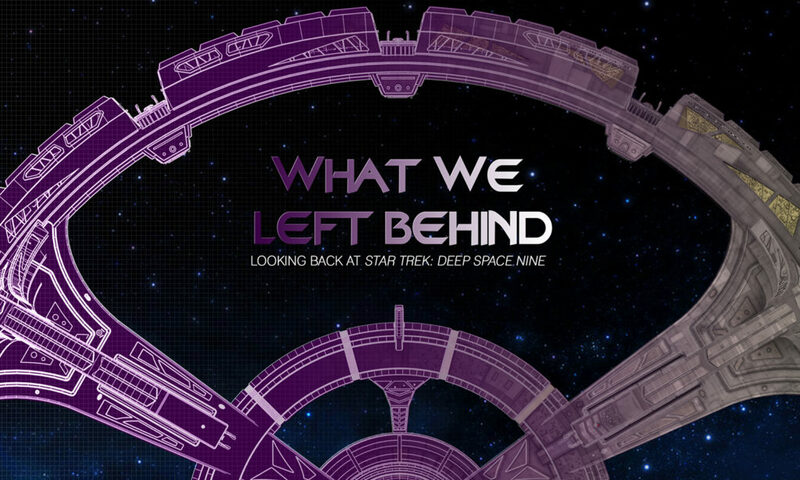 Deep Space 9 documentary WHAT WE LEFT BEHIND gets picked up by SHOUT! Sometimes it pays off to get backlogged on blogging! On March 1st, I received a donor update from IRA STEVEN BEHR on the current status of the crowd-funded Star Trek: Deep Space Nine documentary WHAT WE LEFT BEHIND. Although they held three theatrical screenings late last year in New York, Los Angeles, and London—where select donors and supporters got to see an early “final” cut of the film—things weren’t quite finished yet. In fact, they weren’t even close! I’d planned to share that update here, but in the last 13 days, I’ve published 9 other blogs (and two of those days were spent at Disneyland). So the DS9 news was pushed to the bottom of my “to do” list until this week. No big deal—updates about the DS9 documentary are not very frequent anyway. The news could certainly wait a week or two, right? 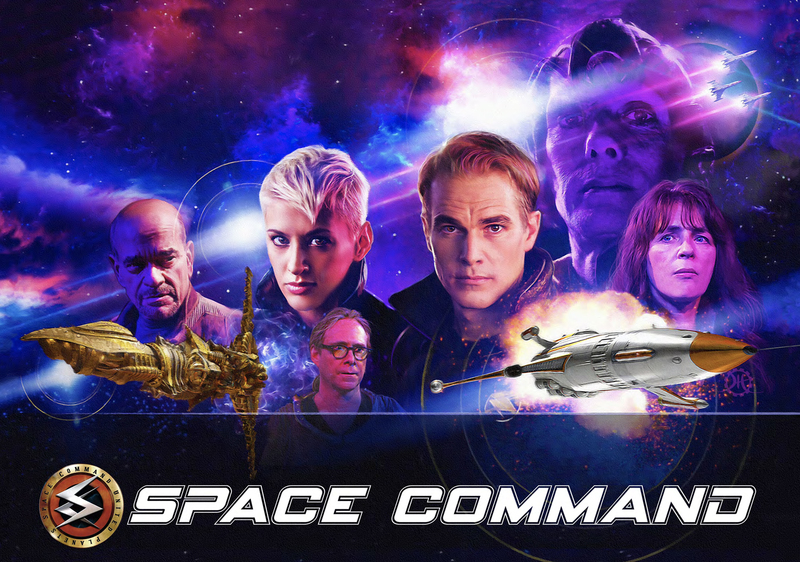 Author Jonathan LanePosted on March 14, 2019 April 9, 2019 Categories Fan Film Features, NewsTags Ira Steven Behr, Star Trek: Deep Space Nine, What We Left Behind2 Comments on Deep Space 9 documentary WHAT WE LEFT BEHIND gets picked up by SHOUT! 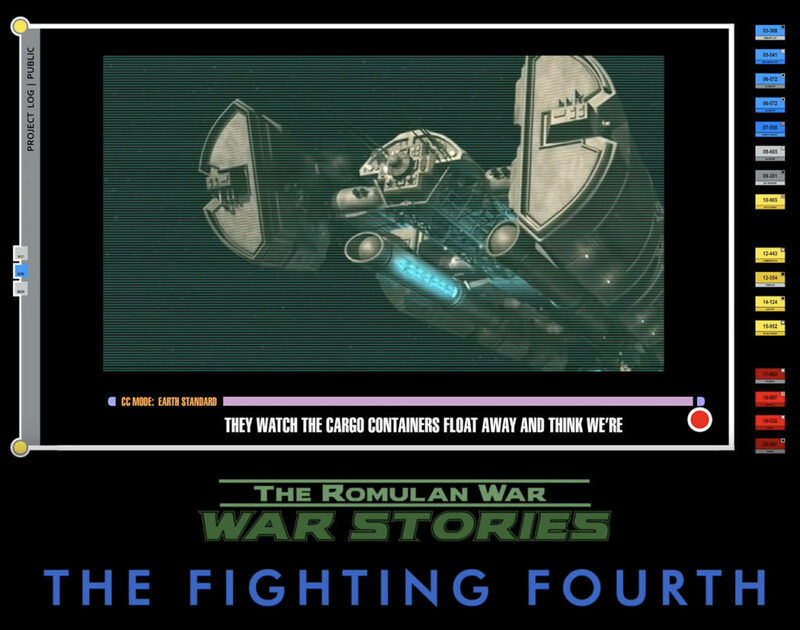 THE ROMULAN WAR releases newest WAR STORIES: “THE FIGHTING FOURTH”! Before continuing, I just want to remind everyone to please donate a few bucks to their Indiegogo campaign. Although they surpassed their original goal, additional footage for the main film was shot by AARON VANDERKLEY in Australia, and Mark needs to reach $14,000 to cover Aaron’s additional expenses. He’s $980 short…can you help him out? Anyway, this latest release is another “enhanced” audio drama, although I think I’d call this a full-on fan film! The difference is that “The Fighting Fourth” actually features a video recording of the main character, not simply the audio recording of log entries “enhanced” with display readouts and various animations. The footage features actor CHEWE NKOLE playing crewman Evander Littlejohn, and the African actor (now living in western Australia) turns in a very strong performance. You can watch the other War Stories vignettes here. THE ROMULAN WAR fan film is now being made on THREE CONTINENTS! One of the fan productions I’m most looking forward to at the moment is MARK NACCARATO’s project focusing on the battles and strategies of THE ROMULAN WAR with Earth. Presented as a war documentary (similar to Prelude to Axanar), Mark’s stories will pick up where Star Trek: Enterprise frustratingly left off: just BEFORE the ware between the Coalition of Planets and the Romulan Star Empire began. 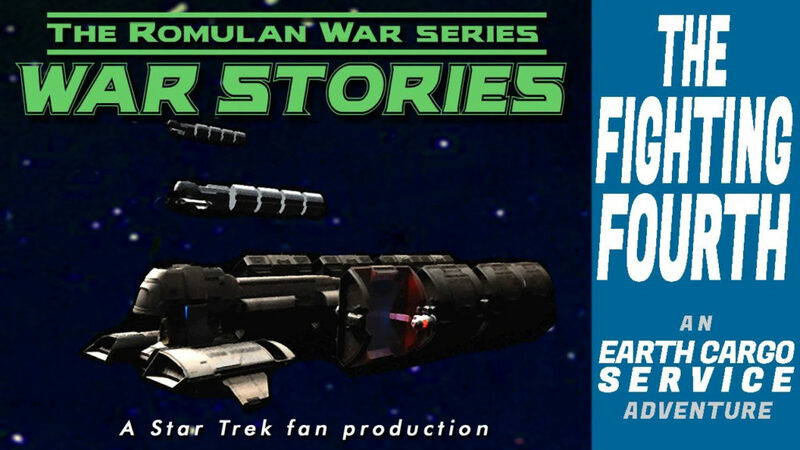 Leading up to the planned May 2019 premiere of the full fan film, Mark has released a series of short “enhanced” audio dramas called WAR STORIES. They typically present personal logs or subspace correspondence made by someone involved in the war, usually recorded by a trained voice actor reading the script. (I say “usually” because I am definitely not a trained actor, but I recorded one myself!) The releases, while available in audio format for listening only, are ALSO available on YouTube with added VFX and other graphics to look like Starfleet archival footage. They’re REALLY cool. This is one of the few fan projects set in the NX-era. Another is the series of amazing and powerful short films produced by AARON VANDERKLEY in Australia. If you haven’t watched them yet, you should check them out. “The Fighting Fourth” will be released first to donors very soon. So if you’d like to see it early, contribute a buck or three to the still-active Indiegogo campaign (now funding post-production costs). Author Jonathan LanePosted on March 1, 2019 March 2, 2019 Categories Fan Film Features, NewsTags Aaron Vanderkley, Mark Naccarato, Samuel Cockings, The Romulan War, Trekyards, War Stories4 Comments on THE ROMULAN WAR fan film is now being made on THREE CONTINENTS! The era of the “big” professional-looking Star Trek fan films is NOT yet over, folks! 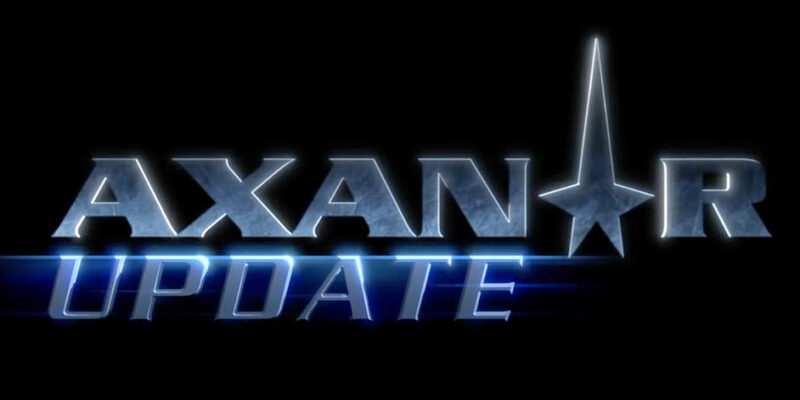 In fact, fans are still awaiting four major productions that predate the guidelines of nearly three years ago: Axanar (of course), Pacific 201, the series finale of Starship Farragut (with a cameo by the late-great Stan Lee), and Star Trek: First Frontier. And one of those four fan films is about to cross over from post-production to release…and it’s just weeks away! I’m sure you’ve already guessed from the title of this blog that it’s STAR TREK: FIRST FRONTIER, a professional-quality fan production that was first conceived back in 2013 by writer/show-runner KENNY SMITH. 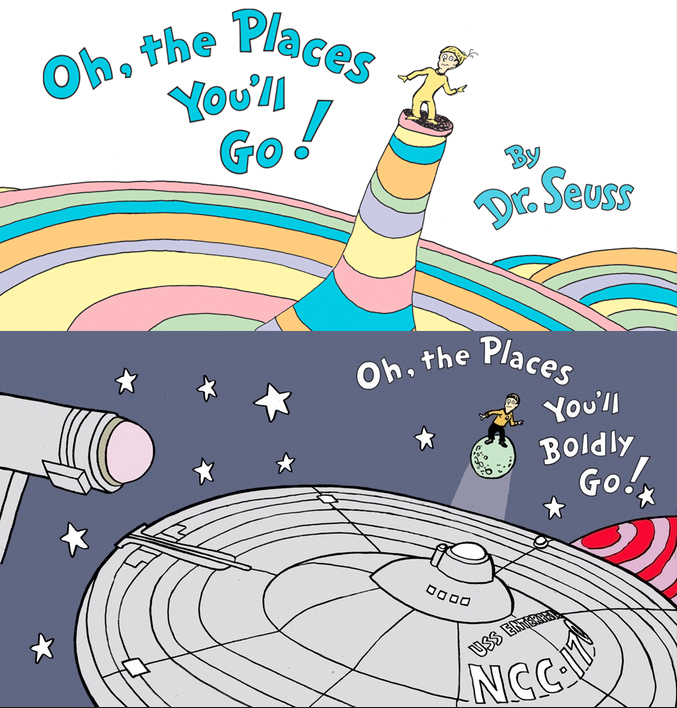 The story features the first captain of the USS Enterprise NCC-1701, Robert April, and his crew on their maiden voyage. The actors are trained professionals, the uniforms and sets constructed to look pre-Pike era (TOS, not Discovery), and the production crew were mostly industry folks with experience. I know the guidelines preclude most of the above now, but all of the production footage was “in the can” nearly a year BEFORE the guidelines were ever announced. After an aborted 2015 Kickstarter that only raised $30K of a $130K goal, Kenny decided to fund the production himself, filming scenes using a mix of practical sets and green screen shots later that year. Originally planned for a September 2016 release to celebrate the 50th anniversary of Star Trek, and even though all the live action scenes were filmed, post-production would end up taking three times longer than anticipated! But they had a very good excuse! The production decided NOT to use traditional CGI animation and instead built a physical 11-foot model of April’s Enterprise (estimated materials and labor cost $30,000) and filmed the VFX the old fashioned way…in a studio in front of a giant green screen! After shooting that gorgeous starship model in early 2017, they next went on to construct an equally-amazing 1/24th scale hangar deck and shuttlecraft for a number of VFX scenes that take place in that area of the ship. Photos of their incredible miniature shuttle bay have only just begun to circulate, and fans’ jaws are dropping left and right! 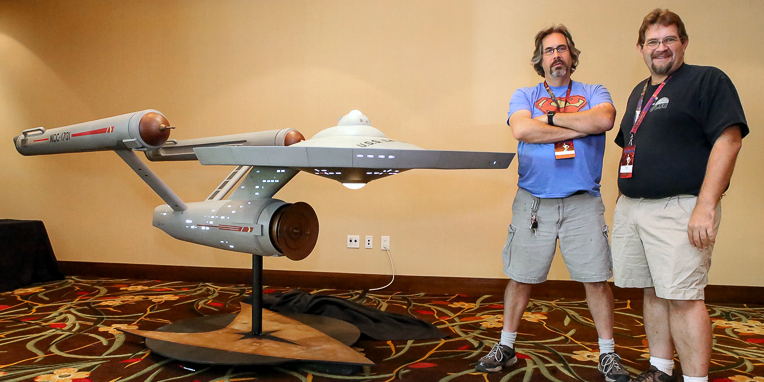 The Arkansas TOS sets formerly known as STARBASE STUDIOS have just been AUCTIONED! And so it ends…not with a bang but with an auction. Some of these were filmed in Oklahoma at what was dubbed STARBASE STUDIOS and utilized additional sets that were constructed, like sickbay, the trasnporter room, and the briefing room. Other fan films were shot after the sets were moved to neighboring Arkansas when Starbase Studios lost their free rent deal in OKC. However, as time went on, time was also running out. The sets had been moved to a run-down former amusement park called Dogpatch in Marble Falls, AR. But that location was only available until this past December 31, 2018. After that, the sets had to either be removed and relocated or considered abandoned property. 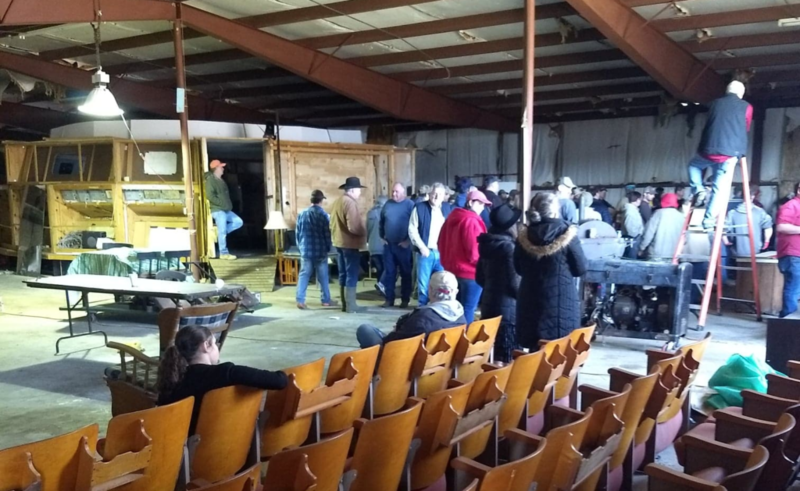 Author Jonathan LanePosted on February 25, 2019 February 25, 2019 Categories NewsTags Dan Reynolds, Glen L. Wolfe, Glenn Miller, Kent Edwards, Scott Johnson, Starbase Studios39 Comments on The Arkansas TOS sets formerly known as STARBASE STUDIOS have just been AUCTIONED!